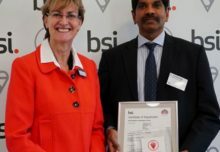 The Electrical Contractors’ Association (ECA) has implemented a series of energy saving initiatives to reduce the carbon footprint at its head offices in London. This comes as part of the ECA’s involvement in the ‘100 Days of Carbon Clean Up,’ launched by the Chartered Institute of Building Services (CIBSE) in June this year. The campaign is aimed at cutting carbon dioxide emissions due to energy consumption in buildings and the ECA is one of over 500 organisations signed up to reduce emissions from its own premises. •	High frequency light fittings that will save over 50% on energy usage and running costs. •	A custom-built mechanical services control panel, with the latest controllers to which boilers, pumps, fans and control valves are connected, reducing running costs and providing more accurate control over equipment. •	Optical light sensors in perimeter offices, so that lights switch off automatically when there is sufficient daylight. •	Motion detectors to switch off lighting in bathrooms when empty. •	Timers on staff coffee machines, so they only operate during working hours. In addition to this the ECA has also appointed ‘green wardens’ to help ensure that staff are actively involved in reducing energy use, and as a conduit for employee feedback on energy saving ideas.